Note that the net effect of a triple bonded group such as ≡N is -1, made up from +1 in the σ bond and -2 for the two π bonds. As for a double bond, the S≡N bond takes up more room than a single bond and this causes the F3S≡N F-S-F bond to drop a little below the ideal tetrahedral bond angle. The geometry of trifluorothionitrile, F3S≡N. 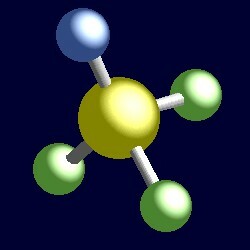 You can use your mouse to rotate the molecule in the right hand "JMol" image.